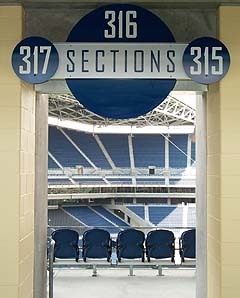 Seahawks Stadium, like Safeco Field, has two levels of premium club seating and private suites that provide additional amenities and service. The suites at the new stadium also have removable windows that allow fans to feel closer to the action on the field. When he purchased the Seattle Seahawks in 1997, Paul Allen sought to provide a new state-of-the-art football stadium for the Seattle area. The Kingdome had been designed to accommodate multiple sports and ushered Seattle into the big leagues. But compared to other big-league stadiums, the Kingdome lacked many of the amenities and revenue-generating components that could enable it to compete. The Kingdome suffered from narrow concourses, limited choice of concessions, awkward vertical circulation and inadequate supporting infrastructure. It also did not have sufficient private suites or premium seating. The private suites were difficult to market because of their compromised locations. Also missing was a collegiate atmosphere — the sounds, sights and smells found at autumn games played in outdoor stadiums. Allen’s vision was to develop a grand new stadium that enhanced the fan’s experience beyond the game. The design for the new stadium was led by Ellerbe Becket of Kansas City, Mo. Streeter & Associates Architects mobilized a project team of 11 architects to produce about half of the architectural design documents in Seattle. The stadium architectural drawings were jointly developed, with Ellerbe taking the lead on the exterior shell, suites and team facilities, and Streeter taking the remainder of the interior spaces. Each firm developed its own drawing files on shared backgrounds and merged the data into final drawings using the Internet. Background drawing files were posted weekly on the project FTP site for all of the design and construction team members to access for their use. A weekly videoconference was held to coordinate design team, contractor and owner issues. The design-build subcontractors were able to develop their designs concurrently with the design team, improving interdisciplinary coordination. It was the Seattle Mariners that first chose to develop a new ballpark. It was designed specifically for major league baseball, with a capacity of 43,000 spectators. The Seahawks also sought a specially designed facility, but with a seating capacity of 72,000. The two projects follow a national trend of replacing multiuse stadiums with specialized stadiums and arenas. Improving the fan experience was a stated goal for both the Mariners and the Seahawks. So how do the two new stadiums achieve that goal? Seattle’s two new stadiums share many common elements. Both facilities are configured around the shape of their playing field. 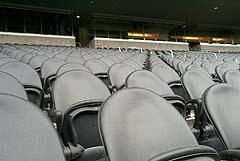 In both stadiums the seating arrangement consist of an upper and a lower seating bowl for general admission seating. Each has two levels of premium club seating and private suites that provide additional amenities and service. 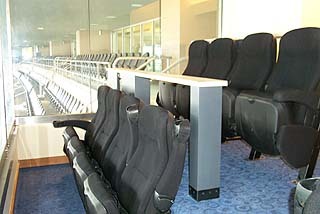 All seating is oriented to the center of the playing field. Concourses are open and spacious, with city views in all directions. 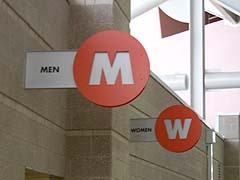 There are twice the number of toilets provided in the Kingdome, with 50 percent allocated to women. Food quality and menu choices are greatly improved. A variety of bars and restaurants are distributed throughout. So what are some of the differences that make our two new stadiums unique? Besides the obvious size, configuration and Safeco’s movable roof, there are the fan amenities. But the most fundamental difference is the number of events hosted each year. Safeco Field holds at least 81 ballgames annually, many more than Seahawks Stadium will. This fact affected many design decisions. Football is a once-a-week weekend event rather than a “homestand” series of games. Fewer events generate larger crowds and the corresponding need for larger ramps, concourses, restrooms, concessions and all of the supporting “back of house” areas. Whereas Safeco Field was designed as a single-sport facility, the Seahawks have built in flexibility to adapt to additional year-round events. The new stadium has been designed to accommodate professional football and soccer games as well as concerts and rugby, college and high school games. The field has been sized and sightlines developed for international soccer events. Located below the main seating bowl is a pair of soccer-team locker rooms separate from the football locker rooms. A unique feature of the new stadium is the attached exhibition center. The exhibition center and stadium have been designed to support each other. Flat shows and small convention events held in the 325,000-square-foot exhibition center will be able to overflow for larger events into the 82,000-square-foot north hall space on the west side of the stadium though a connection linking the two buildings. The commissary, loading dock, parking and other operations will be shared. Both stadiums have audio systems designed to adapt to on-the-field concert events. In addition, the Seahawks have developed their north plaza so that brown-bag and community-type events can be held using the grand staircase as informal seating. Typically, concession stands and restroom facilities are developed as small buildings or “pods” tucked in under the grandstands. At Safeco Field these pods were squeezed into the odd-shaped concourses created by the asymmetrical field geometry and the site boundaries. There are no two pods alike. With Seahawks Stadium, each floor level has a typical pod design, appropriate to the needs of that level. The football seating bowl has a symmetrical shape about the north-south and east-west axis so that most of the structural and building spaces are repeated or “mirrored” on either side of these axis. This allows a typical pod design to be repeated around the bowl, adding simplicity and economy. Another major difference between football and baseball venues is that concessions and restrooms receive a large surge of use during halftime. In the new stadium a total of 346 concession points of sale will be located proportionate to the nearby seating. 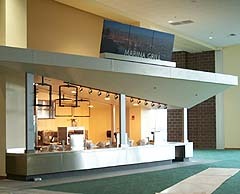 Concourses are wide enough to provide both concession stand queuing and circulation. Like Safeco Field the new stadium will have twice as many sinks and toilets as the Kingdome. Most restrooms have two entries and all of them have enough interior queuing space that the lines will not extend into the concourse. When fans enter the north hall they will notice the dramatic light-filled two-story entrance space that sets the character for the colors and materials used throughout. Wayfinding and location signs will add a colorful and modern graphic display. The overall effect will have a sleek contemporary look, rather than the retro feel at Safeco. Both projects have taken a different approach to a specialized professional stadium, with exciting results. Soon Paul Allen’s dream of a dynamic open-air stadium will be fulfilled on Sunday afternoons, replete with happy Seattle fans. Jim Kressbach is a senior associate with Streeter & Associates Architects, which also helped design Safeco Field.